Family and friends are as excited as parents to be when expecting a new baby. That is why they would exert much effort to throw baby showers. Baby showers are like new beginnings. It is a benchmark of another bright start for couples. Well, we really cannot deny the fact that when someone is expecting a baby, everyone gets the feeling of excitement. The happiness of a couple is contagious. This makes baby shower more fun since everyone is sharing the same joy. I came across Pottery Barn Kids and found some cute baby shower ideas. If you are planning to host one, you will surely be glad to find this because you will not only get an idea on what to do but you will also be given tips, guides and printables that you can use for the baby shower you are hosting. Look into these fun baby shower ideas where you will spend less but enjoy more! A nautical themed baby shower with blues and whites. This would be great for your little sailor who is about to come and would even be perfect in an outdoor environment. Numbers and clocks are used for this clock baby shower. Well, you think clocks are boring? With this look and the DIY tips you'll get to see for this kind of party, you will surely realize that a clock theme will never be boring. Tick tock tick tock. Time is ticking before baby comes out! A robot themed baby shower could be the good way to welcome your little boy into the family. Robots can actually look cute especially with sweets and baby stuff around! If you are still unsure if your getting a boy or a girl, why not combine blue and pink for your baby shower? The combination looks perfect for a baby shower. Get ready for sweet bedtime stories by having a storybook themed baby shower. Gather books for your little one so you will have remarkable stories to tell. 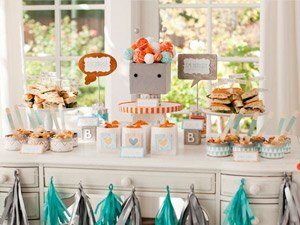 You will have a good time with a sunshine baby shower with tips and printable items from the designer herself. Bring out the sunshine as you prepare to welcome your baby into your lives. For moms-to-be of cutie twins, this shower theme party with polka dots and gingham is a good choice. Get a complete guide of how to held the above mentioned baby showers from Pottery Barn Kids Baby Showers. You will get DIY tips and printables which you can use for this once in a lifetime event. Make sure that it will be fun-filled so that moms to be will feel totally happy. Baby showers are indeed exciting with the mere thought the a new baby is coming. But it becomes more exciting when family and friends come to celebrate with you. If you need more guides for your baby shower, you can look into The Everything Baby Shower Book , How To Plan A Baby Shower: Plan the perfect baby shower - checklist, games, ideas and Themed Baby Showers : Mother Goose to Noah's Ark: Hundreds of Creative Shower Ideas . These books are great for those who are eyeing to host an unforgettable baby shower for moms-to-be!